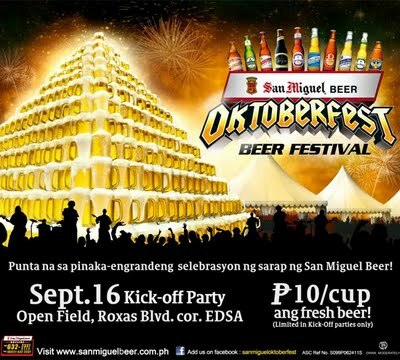 The countries most awaited rock en roll and beer festival "SAN MIGUEL OKTOBERFEST BEER FESTIVAL 2011" will kick off on Sept 16, 2011 at Open Field, Roxas Blvd..
Maki party na! P10.00 per cup lang ang beer sa mga Kick-Off parties! The Oktoberfest 9-ball Open is a nationwide billiard tournament that is open to both amateur and professional Filipino players. There are 3 regional qualifiers wherein the top 2 players of each regional qualifier will be sent to Manila to be part of a 3-day final round. The Finals will be a competition among top regional qualifiers, top Manila qualifiers and seeded players. Cash prizes to be given away to the top 16 placers amounting to over P1,000,000.00. The San Miguel Oktoberfest Beer Festival Tansankatutak Promo is a crown collection promo that gives away a SMB functional miniature bottle in exchange for 11 crowns of any San Miguel Beer, and one (1) set or ten (10) multi-use SMB functional miniature bottles in exchange for 100 crowns of any San Miguel Beer. The SMB functional mini bottle can be redeemed at San Miguel Brewery Inc. Sales Offices or Baliwag Lechon Manok kiosks and restaurants. Thanks for sharing the schedule... I've been waiting for Oktoberfest...inuman na!